The representation of diverse groups in politics and policy-making process constitutes one of the pillars of democratic regimes. However, Muslim minorities in the European countries face a considerable lack of political representation. Only a few of conservative Muslims manage to get a position in national politics and legislative institutions. Moreover, the presence of Muslim deputies in some European states’ parliaments does not automatically lead to the political representation of Muslims and their interests. SETA European Studies have already conducted many studies on this issue, including Şener Aktürk’s report on “Political Engineering and the Exclusion of Religious Conservative Muslims in Europe” published in May 2018. 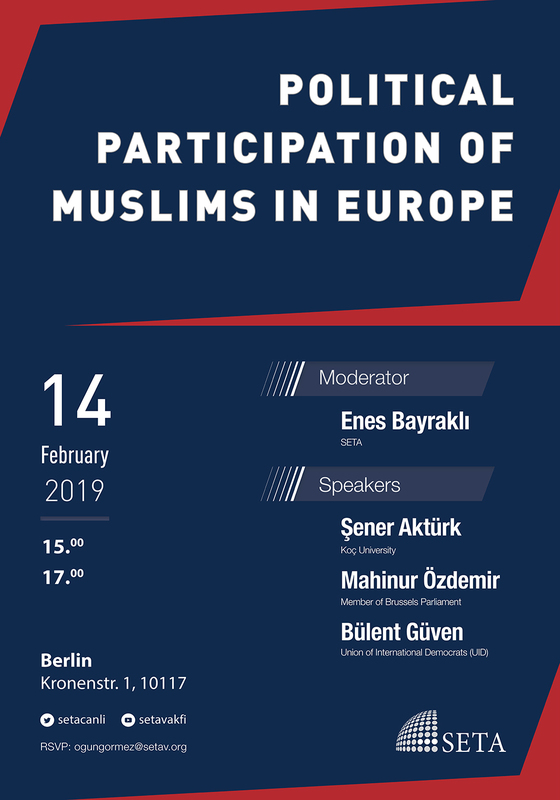 This panel will be the occasion to present the main findings of this research that analysed Muslim political representation in 12 European countries. Enes Bayraklı, the director of European studies at SETA, will lead the discussion in company of Şener Aktürk, the author of the report, of Mahinur Özdemir, the first European Deputy wearing headscarf and of Bulent Güven, member of the board of directors responsible for political affairs of Union of International Democrats (UID). We courteously invite all those who might be interested to participate in the panel. PS: Simultaneous translation will be provided.